It starts in the morning when that alarm clock shatters the peace. From then on it’s all out. Listening to ‘the news’ doesn’t exactly provide inspired motivation! First challenge – getting to work. Whether it’s by car or train it’s almost guaranteed to raise the stress levels. Ok – you finally make it. Grab a coffee and no sooner do you get stuck into your ‘To Do List’ than the phone rings or the boss calls and very soon you get the feeling that you’re on everybody else’s To Do List ! And so it goes until, with a seemingly longer list than when you started, the end of the day comes. Yup – it’s time for the homeward battle. Add to all that there are all the relationship demands and financial gymnastics to perform. Finding respite from all that life’s demands place upon you is necessary for your own physical and emotional well being. In fact it’s a must. All research has shown us that relaxation is is essential in relieving stress. And where are going you find it ? Right in your own back yard. What better answer than creating a patio area where you can unwind and de-stress. What Sort of Patio Should You Build? The simple answer is of course whatever works for you and fits with your location. There is no one defining material. A wide range of materials can be used to create a a patio the most common being concrete, stone, paving, brick or tile. And wood is an option too as we can include decking in the patio definition. In fact decking might be a good way to extend a concrete space you already have. The size of the patio depends on how much space you have available. If the area is to be exclusively for your relaxation then a smaller intimate space is all that’s required. But if you plan to use it for alfresco entertaining then you clearly have to scale up your ideas and be thinking on a grander scale. Another consideration is whether the patio will be raised or at ground level. Or maybe a combination of a raised area with steps going down to ground level. Once the decision has been made on the size you can begin to think about the patio layout. The exciting thing about creating something new is the opportunity it brings to devise interesting shapes. A square shape might well be simpler to build but how much more interesting it is to create curves. Having decided on the layout you’ll need to decide on the method of construction. The most commonly used material is concrete and it’s the one that many people already have in place. It’s not an expensive material and it doesn’t have to be plain, bland white. Concrete can be colored too and there are special paints available for the job. Bricks and paving offer a quick solution to creating an outdoor space. Dig out the ground, fill with a sand base and lay out the bricks or slabs. 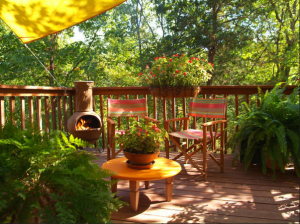 Older decking can be refurbished to give it a new lease of life or a new deck is an easily accomplished project given the availability of ready-to-go materials these days. Many of the home improvement stores offer free DIY classes for this sort of project. A consideration when planning the position and layout of your patio is the amount of direct sunlight. It’s great to feel the wonderful warming effect of the sun but don’t forget that in the height of the summer the heat can be pretty intense and uncomfortable. So do be thinking of the benefits of partial or full shade. Nature itself can offer some beautiful shade so when planning you may be able to take advantage of the surrounding trees that could offer respite from the sun’s rays. Not everyone has suitable trees around their property though so an alternative might be placing trees in large containers around the patio. The drawback here though is that the trees will be cumbersome to move around and they are quite vulnerable to drying out and less hardy against winter frosts. If you are happy with DIY projects an attractive solution could be a pergola covered area with climbing plants to create shade. It’ll be a while before the plants establish well enough to create a reliable shade but a temporary solution would be to cover it with natural-looking bamboo or brushwood screening. Alternatively you could use a simple frame which you can buy or build and stretch a lightweight patio canvas across. If the patio is adjacent to the house you can use a retractable awning that attaches to the house. Canvas and awning materials do come in attractive designs which can lend a bright splash of color to your space. Furnishing your patio will be an important purchase. There is a whole wide range of styles and materials on the market. Wicker, metal, plastic, wood – you are faced with a huge choice but the decision boils down to how it’ll be used, its comfort and your design taste. You’ll be wanting a Chaise Lounge. It’s one of the most comfortable and relaxing pieces of furniture. The perfect place to just stretch out and unwind with a cool drink after work. Mmm – makes me feel relaxed just thinking about it. And how about a small, low table alongside for your books or a bottle in a cooler? Having a larger table is a must for social events. You’ll be needing somewhere to set food while you’re preparing outdoor picnics. And it’s a place to keep the ingredients handy for outdoor grilling and for the kids to use for their projects. The table will need an umbrella to provide shade. There are those that fit through a hole in the centre of the table that come in many sizes. There are also the larger side-style umbrellas that have a secure stand and which cantilever out to hang above the table. The great advantage with this style is that they can be moved to different places around the patio. Of course holding social occasions means that you’re going to be needing seats for people around the table and places for people to relax too. Matching seats are available to co-ordinate with the table and there is a wide choice of garden seats to choose from. One good solution is to use garden benches. While a patio is an excellent recluse for you to unwind from all the day’s stresses it’s also a super setting for enabling couples to re-connect. How about sitting by a small bistro table set with a candle while watching dusk fall or on a double settee chair amongst potted trees and trailing plants surrounded by tea lights? That really sounds appealing to me. I’m really taken by the idea of a fire pit table to sit around with a friend or partner sharing a glass of wine whilst staring into the glow of the fire. It’s also a great place for the entire family to share. A barbecue appeals to all ages and friends too. You can easily set up a portable grill or maybe you opt for one of those built-in brick models. There’s something about outdoor cooking that makes food taste better. If you fancy the idea of something more permanent you can buy a prefab brick oven in kit form of brick or granite. You can even go the whole hog and buy islands for the patio to create a luxury outdoor kitchen. A patio offers just so many ways to unwind. 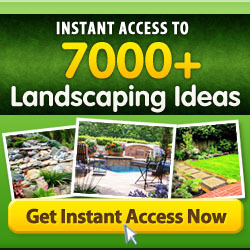 How about creating a garden oasis filled with lush color and fragrance? Container or vertical gardening is easy to do and superb results can be obtained without a lot of cultivation and care. The right choice of plants can bring a gorgeous flower display to encourage butterflies and bees and herbs to complement the food you prepare – indoors and out. Use a variety of container sizes and shapes to bring shape and style to your patio. You’ll be creating a haven of peace that will welcome your return each day and you’ll enjoy it for years to come. Do have fun. All these possibilities have got me excited now too!